After unveiling its tough looking rescue themed show truck at the Chicago Auto Show in February, NewScope Marketing was ready to continue parading it around the country, looking tough. But then a tornado ripped through Arlington, Texas, and a local fire department needed all the help it could get cleaning up the mess. 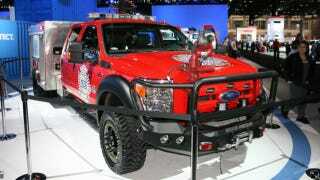 All of a sudden, the company's custom Ford F-550 rescue truck was called upon to walk the walk. Here's how it did. "We were glad to build a truck for Ford, but we never planned to put it into service," said Brad Snyder, NewScope's vice president of marketing. "It was nice to see something we'd planned out on paper put to good use in real life." Snyder said that Granbury, Texas-based NewScope builds display vehicles, cutaway engines and other nuts and bolts promotional material for the Blue Oval, but this is the first time something they've built has been put to the test. When a series of powerful tornados tore across the Dallas area on April 3, they yanked down power lines, hurled large debris around and severely damaged nearly 100 homes. Arlington was hit hard, so city officials asked other communities for help. The Granbury Volunteer Fire Department had provided a lot of input on NewScope's rescue truck, and figured it would do well in the storm's aftermath. From a stock show and rodeo in Houston, Snyder redeployed the truck, driving it into rubble strewn Arlington to help the city's fire department. "You see this kind of stuff on TV and you go whoa, that was bad," said Snyder, recalling being taken aback by a transformer that had been flung by a twister into someone's backyard pool. "But when you're there and you see people's homes destroyed, it's really striking." NewScope's burly F-550, outfitted with a 6.7 liter Powerstroke diesel engine, aggressive offroad tires and wheels, thermal imaging equipment and an array of bright LED exterior lighting, slipped into the hellscape and made itself useful. About 28,000 buildings had lost power, but the truck's powerful lighting illuminated both sides of whatever street it was on so that rescue workers could assess and mark damaged structures without stumbling into unsafe conditions in the dark. "We knew what a 550 would drive like, but with offroad tires and custom wheels, we didn't know exactly how it would do," Snyder said. "It beat our expectations on what we thought it would do. The turning radius was great, and Ford's new live PTO (power takeoff) let us run the truck and the generator at the same time and all off of the same fuel system." Ford sells a lot of chassis cab F-450s and F-550s. Basically, they're stripped down pickup trucks with standardized frame rail measurements, designed so that any aftermarket utility bed manufacturer — such as NewScope in this case — can bolt their custom equipment to the back of the truck. Mike Levine, a Ford Trucks spokesperson, said that Ford sells roughly 1,000 light duty (well, when you compare them to fire engines) trucks to fire departments every year, a small number of the 585,000 F-series trucks they sold last year. NewScape's custom truck worked great, but Snyder said what really left an impression on him was how people whose homes had been destroyed bent over backwards to help one another. "It's nice to know that we live in a country where people will go out of their way to help their neighbors."